2019 Sunrise Business Expo took place Thursday March 14th at the Sunrise Civic Center in the City of Sunrise, Florida. Ana owner of SERVPRO of Sunrise franchise attended the event and the photos are with David Iannacone, David Hanser and Elizabeth Kahn, also member of the Greater Sunrise Chamber of Commerce with St. Patrick's decorations. Great turnout at Advanced Insurance-Risk Strategies CE Class Understanding Mold in the Restoration Industry. We want to congratulate all of the Sklar team for the great Kickoff 2019 meeting you hosted. Great attendance, education and networking opportunities. Successful presentation and class by Ana our owner to the Realtors of Weichert Best Beach Real Estate. We share topics of Fire & Water Damage and Mold Remediation among other SERVPRO of Sunrise services. 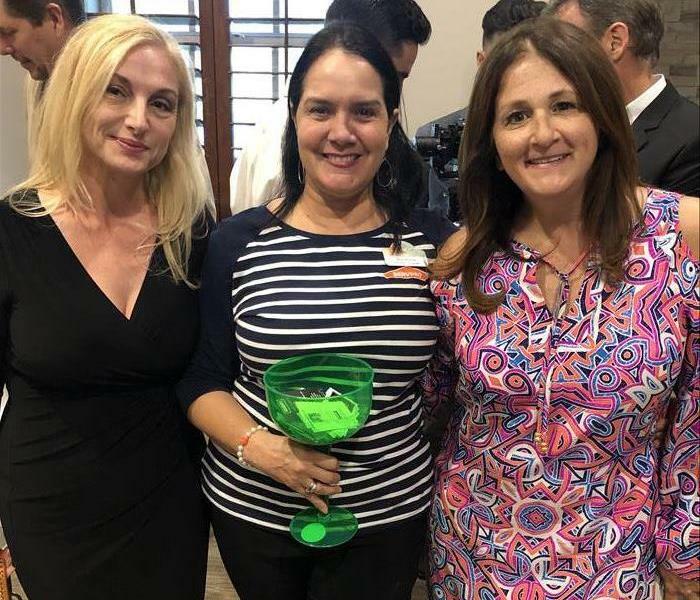 Ana the Owner and Jennifer the Marketing Rep With Marlene Regional Director of Realty World at their Annual Event in Weston, FL. This course has been approved by the Florida Department of Financial Services for CAM continuing education credit. Community Associations Institute 2017 Expo took place on October 5, at the Gulfstream Park's Sport of Kings Room. They donated portions of the Expo proceeds to the Red Cross with $2,500 earmarked for Hurricane Harvey and $2,500 earmarked for Hurricane Irma. SERVPRO was happy to attend. SERVPRO of Sunrise attending City of Sunrise Night Out Against Crime. We participated like every year supporting City of Sunrise Police Department. 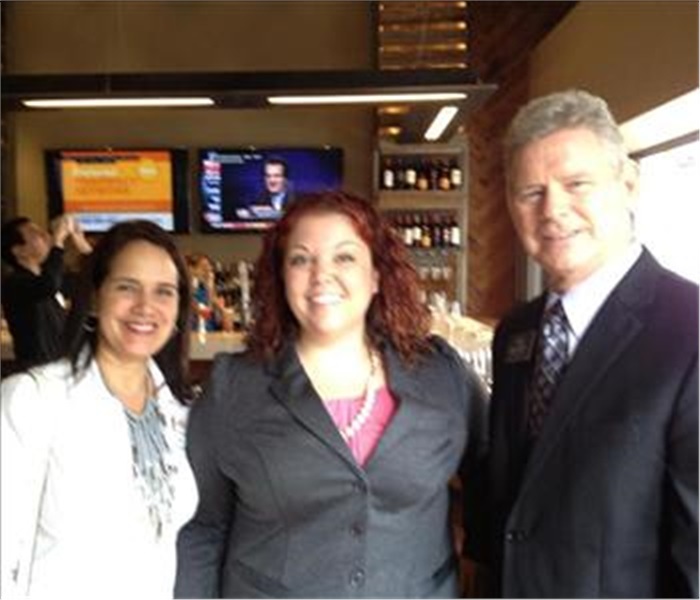 We attended with the Greater Sunrise Chamber of Commerce and some other members. Lunch and Learn hosted and sponsored by SERVPRO of Sunrise. 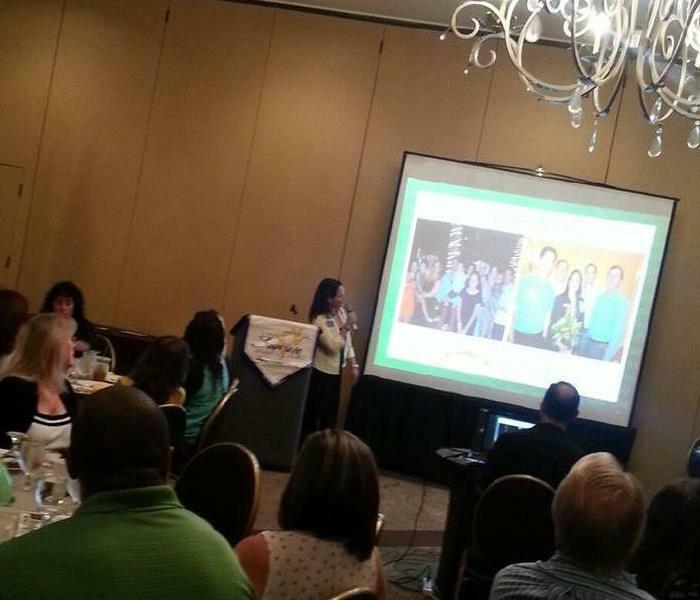 Presentation done by Ana, Owner and Marketing Manager, on SERVPRO and A Clean house Sells Faster! 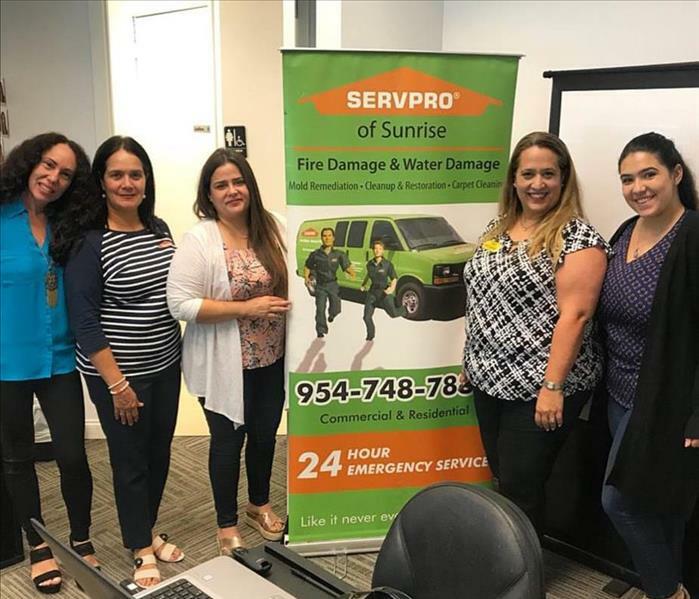 SERVPRO of Sunrise owner Ana and Mary Molina-Macfie, Secretary of The Broward Coalition at the last meeting before the summer break. 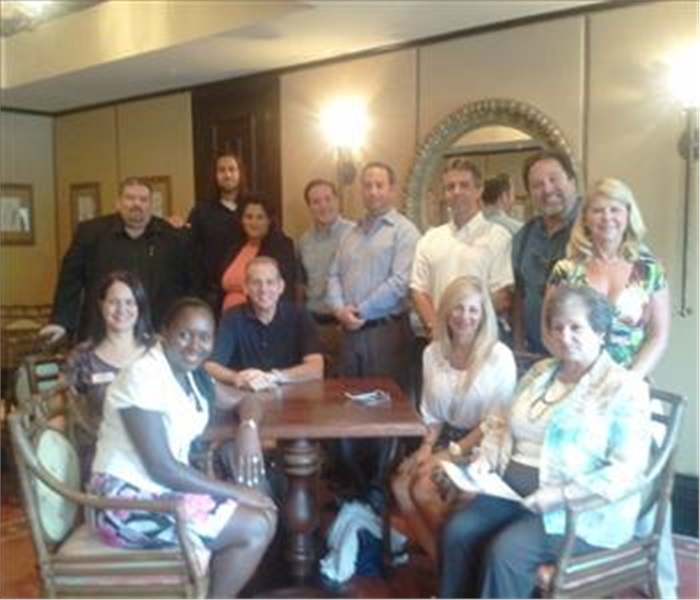 SERVPRO of Sunrise is a proud member of the association that meets the second Friday of every month. Wild, Wild, West Leads Group! 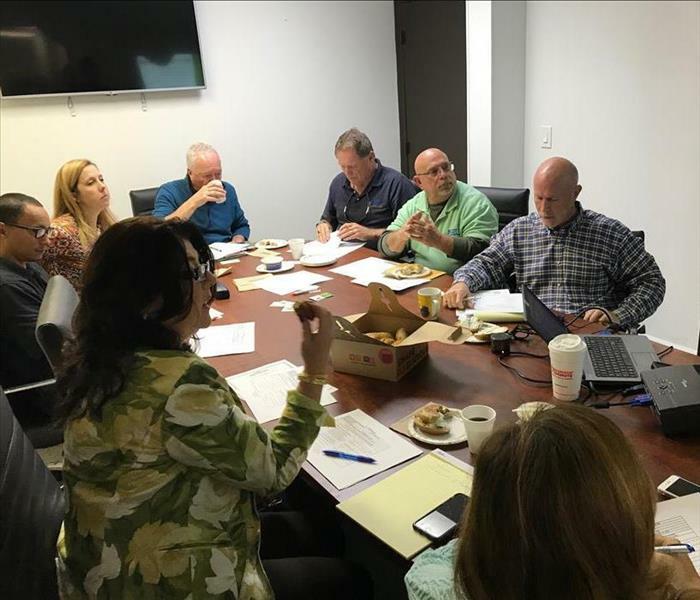 SERVPRO of Sunrise sponsored and presented on the biweekly Sunrise Chamber of Commerce Leads Group and one business of a kind. Several business attended, including Brian Feurer, Executive Director of The Greater Sunrise Chamber of Commerce. One of the guest speakers was Pam Evans, a seasoned Learning and Development Professional with extensive experience in organizational diagnosis, and the design and facilitation of both large and small scale professional development initiatives and training and Erick Montealegre UPS Florida District Marketing Manager. In the photo, Anamilena SERVPRO of Sunrise owner Dr. McPherson, past president of the LRCC and Sherry Fell from 5 County Real Estate. 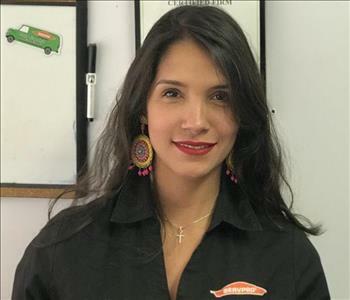 SERVPRO of Sunrise wishing Ana the owner a great birthday on April 8th. Ballons, a cake and a birthday card with a gift card was given in the name all the staff. Cute photo of Owner Ana M Diaz Granados of SERVPRO of Sunrise at the golf event at the Jacaranda Country Club with Geph Scarr from Scarr Insurance group, Tiki Bar sponsor. EWM Assistant Manager in Weston Kelly Morello, with owner Ana Milena at the 1st Real Estate Vendor Showcase. Photo taken at the 2017 State of the City Sunrise Chamber of Commerce breakfast by Mayor Michael Ryan. Event at the Seven Bridges Golf Club in Sunrise, Florida. Broward Coalition 1st meeting back, Friday september 9, 2016. SERVPRO of Sunrise, sponsor this event located in Sunrise lakes phase IV, Grand Ballroom 10102 Sunrise Lakes Blvd Sunrise, Florida. Faster to any Size Disaster. 24-Hour Emergency Service. "Ready for Whatever Happens" was the August theme. Sponsored by ENTRUST Insurance - Jason Bryce and SERVPRO of Sunrise - Ana Diazgranados. SERVPRO of Sunrise provided very important information to the community on how to be prepared if something sudden happens like water damage and fire. The location was at Seven Bridges Golf Club in Sunrise. At the Public Safety Building 10440 W. Oakland Park Boulevard. SERVPRO of Sunrise is proud to support the City of Sunrise, Fire, Police Department and The Greater Sunrise Chamber Of Commerce, even under the rain. Take a look at our marketing team Margarita & Lilly all wet. Real estate agents and Porperty Managers attended in order to receive 3 credits. Location: Comfort Suites Weston. June 9/2016. SERVPRO OF SUNRISE hosted a C.E CLASS. 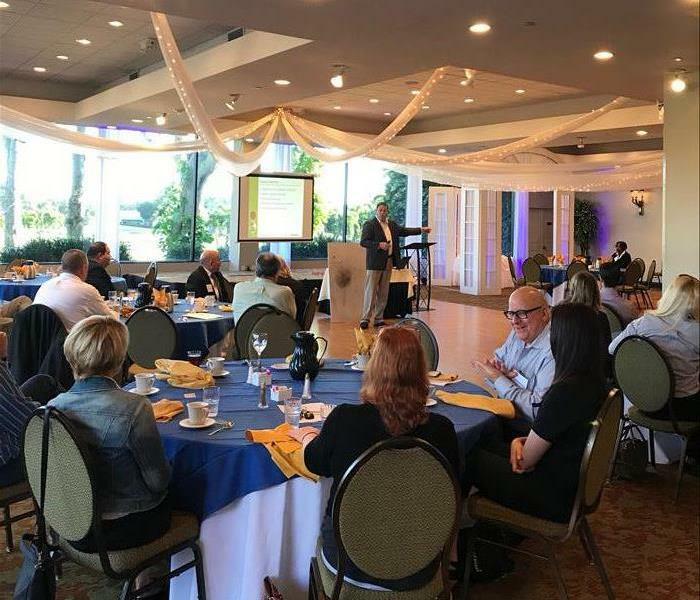 "The Science of Restorative Drying"
Event by the Greater Sunrise Chamber of Commerce to honor City of Sunrise business colleagues in our community at Sawgrass Grand Hotel in Sunrise. Outstanding civic event attended by many of our city leaders, including Mayor Michael Ryan, as well as owners and managers of many of the areas most successful companies. 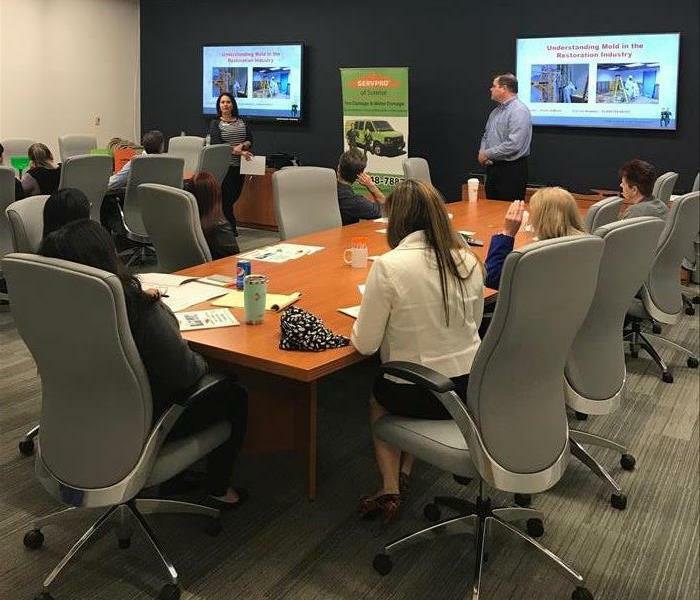 Successful lunch and learn at Taylor & Mathis, Real State Development, Management and Leasing in Sawgrass Corporate Parkway, Ana Milena Diazgranados, Gustavo Daza, Owners and Margarita Canon, SMR from SERVPRO of Sunrise. Margarita Canon, SMR of SERVPRO of Sunrise with Daniel DiGiacomo, Fire Prevention Specialist City of Sunrise. Participating in The Earth day Festival as members of the Dryer Vent Fire Prevention Coalition (DVFPC), in the Saw grass Sanctuary Park located in Sunrise. Ana Milena Diazgranados and Margarita Canon with Alberto Amaya during the meeting of the Emergency Ready Profile (ERP) delivery folder. 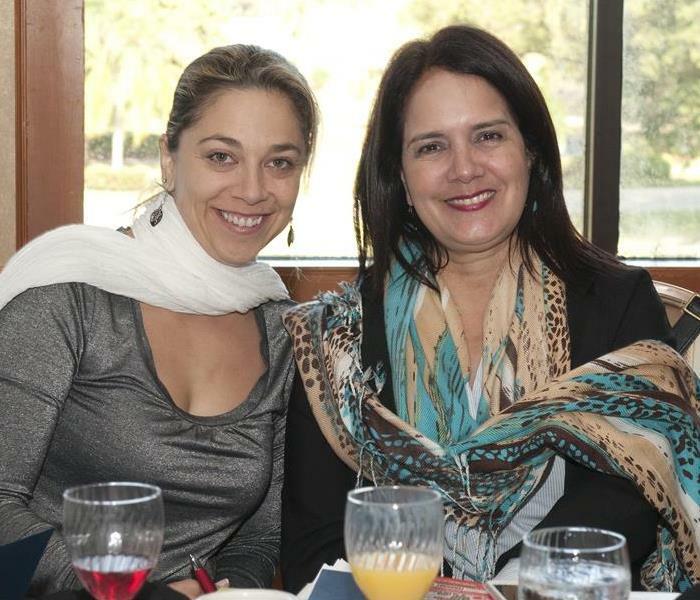 Ana Milnea Owner SERVPRO OF SUNRISE with Margarita Canon Marketing Representative at the Lauderhill Chamber of Commerce networking breakfast. 2015 TAO Sawgrass Lunch & Learn. 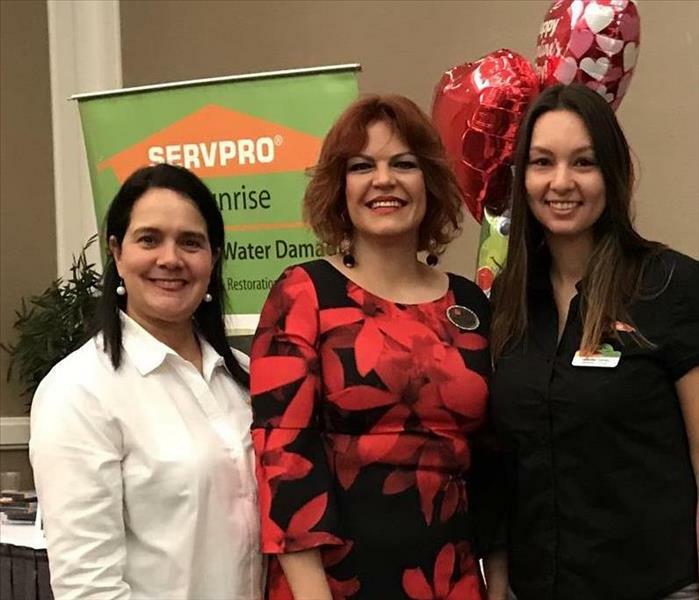 Ana Milena and Gustavo Daza owners of SERVPRO SUNRISE with Carolina Lendaro, Property Manager of TAO Sawgrass at the class of WATER DAMAGE RESTORATION. Carolina Lendaro, Property Manager, scheduled a 1 hour class in "RESTORATIVE DRYING OF WATER DAMAGE " for all her staff at TAO Sawgrass. Gustavo Daza, Production Manager and Ana Milena Owners of SERVPRO OF SUNRISE did the training with the help of Margarita Canon (SMR). It was a great success! ERP presentation of 14 buildings of Las Vistas in Lauderhill. No One Plans to have a Disaster, But You Can Plan For It. By preparing now, you demonstrate excellence in readiness planning by compiling a comprehensive information resource to use in case of a disaster. Timely response in a crisis can: Minimize interruption and associated lost school days. Save thousands of dollars in reduced secondary damage. Timing is everything! Great turn out of our annual Continuing Education Class of Mold Restoration. Thank you to all our attendees and Instructor. 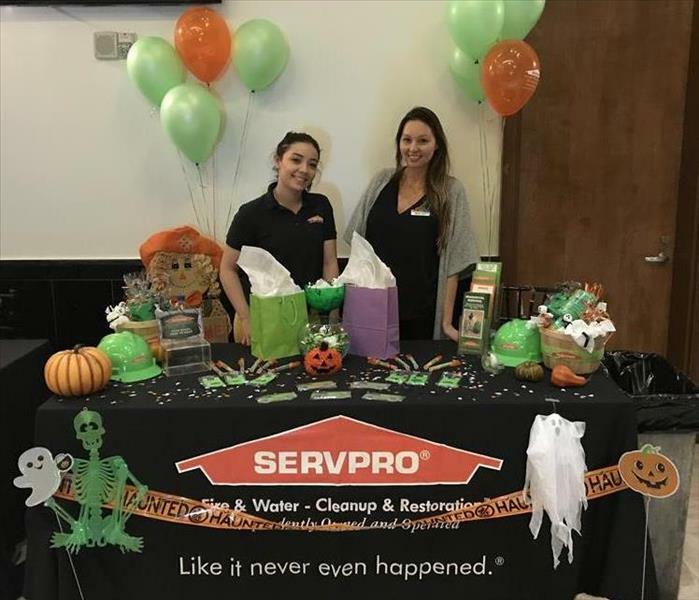 SERVPRO of Sunrise always supporting different communities, sponsoring the Annual Event with the Colombian Volunteer Ladies and proudly representing SERVPRO at our designated station. SERVPRO's attendance to the Community Association Institude-CAI annual expo at Gulfstream Park in Hallandale, FL. So honored to be recognized by the The Greater Sunrise Chamber Of Commerce as Hometown Business 2013— at Woodlands Country Club. Two of our team members at the registration desk welcoming guests to our CE Class Course on November 5th, 2013. Recognition Member of the Year 2013! One of our Estimators, Giselle Cabrera, trick or trating in today's route! SERVPRO of Sunrise Owner, Ana Milena, member of the Year 2013! Our presentation at the Sunrise Chamber of Commerce breakfast meeting this morning! Business Strategy Meeting at Artesia with one of our Marketing Representative, Maritza Marinelli. Juan and Gustavo enjoying an unexpected visit from Jeremy George and Andy Froelich, of SERVPro of Pasco County, Florida West Coast. So nice to meet other franchise owners. 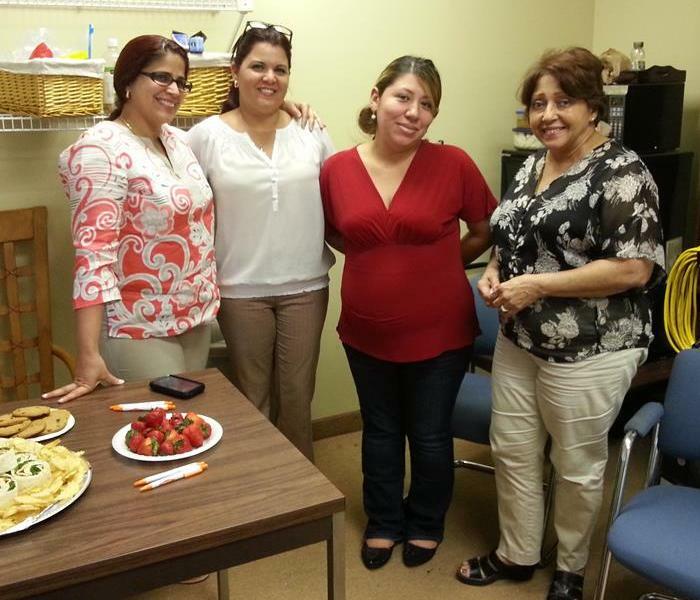 Ferley, one of our crew chiefs, who decorated the office for Ana Milena, owner of SERVPRO of Sunrise, on her birthday! SERVPRO of Sunrise at Sam's Block Party on 03/23/13. 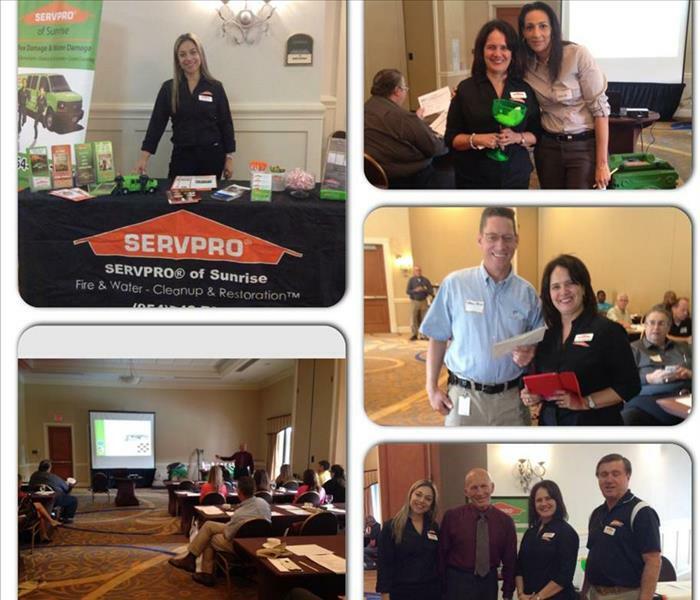 Ana Milena Diaz Granados, one of the owners of SERVPRO of Sunrise, at the SBG presentation on February 5th, 2013. At the office with part of the Staff celebrating Gustavo Daza's birthday, one of the oeners of SERVPRO of Sunrise. January 14, 2013. At the office celebrating Gustavo's birthday, one of the oeners of SERVPRO of Sunrise. January 14, 2013. One of the owners is celebrating his birthday! One of the owners of SERVPRO of Sunrise, Gustavo Daza, is celebrating his birthday today January 14, 2013! California Pizza Kitchen opening at Sawgrass Mills with Ashley, The General Manager and John Ripley, Sunrise Chamber of Commerce Chairman of the Board. November 29th, 2012. A Clean Home Sells Faster, Real Estate Lunch & Learn Presentation at Keller Williams, Pembroke Pines, Florida on Tuesday October 23rd, 2012 by Owner Ana M. Diaz Granados. Great attendance, of aprox. 80 Real Estate Agents. Keller Williams Real Estate Lunch & Learn Presentation. 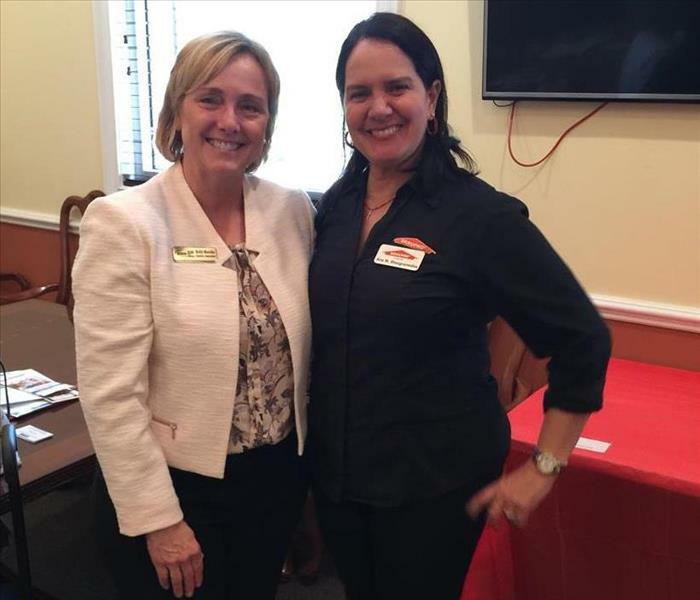 One of the Realtors attending to Keller Williams Real Estate Lunch & Learn Presentation, with Ana Milena Diaz Granados, owner of SERVPRO of Sunrise. 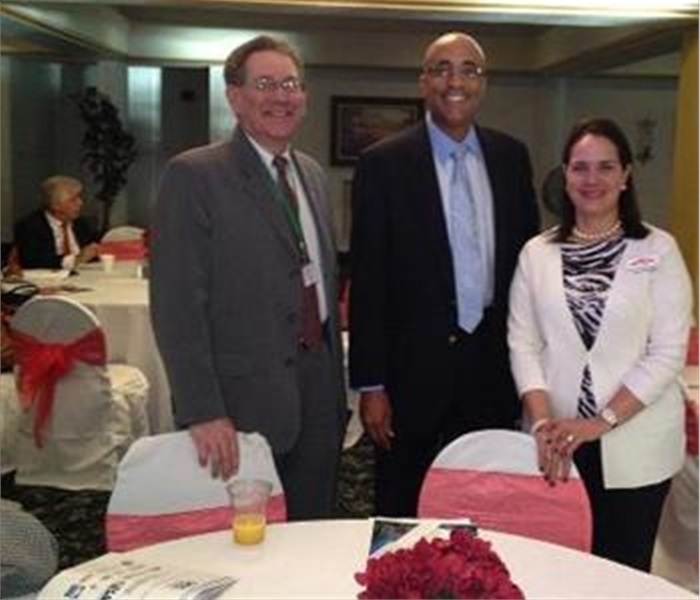 Lauderhill Chamber of Commerce, monthly breakfast with City of Lauderhill Mayor Richard J.Kaplan and John Beckford Chief of Staff, Broward Country Commissioner District 9. At Inverrary Country Club. October 5th, 2012. Night out Against Crime Event on August 7th, 2012 with Mike Ryan, Mayor of City of Sunrise. October 4th, 2012, Lauderhill Regional Chamber of Commerce, 9th Annual International Business Conference & Expo at Inverrary Resort & Hotel in Lauderhill Florida. October 4th, 2012, Lauderhill Regional Chamber of Commerce, 9th annual International Business Conference & Expo Exhibitor at Inverrary Resort & Hotel in Lauderhill Florida. Lunch and learn held in Global Green Insurance Agency. October 4th, 2012, Lauderhill Regional Chamber of Commerce at Inverrary Resort & Hotel in Lauderhill. Ana Milena Diaz Granados, owner Servpro of Sunrise was the I-Pod Winner! 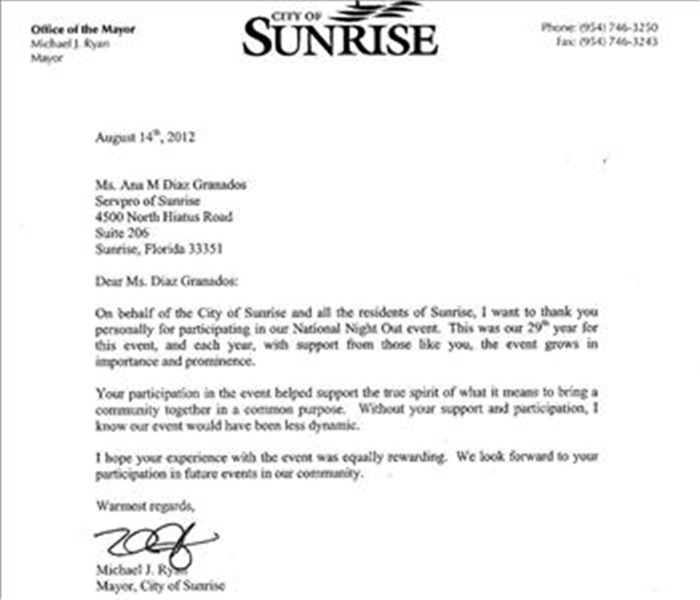 Thank you letter from Michael J. Ryan, Mayor, City of Sunrise, for participating in the city event - National Night Out Against Crime. 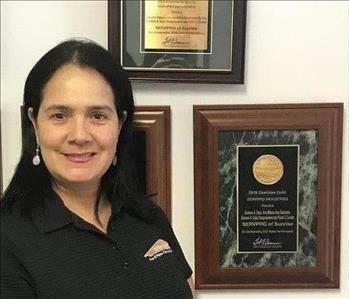 Ana M Diaz Granados owner of SERVPRO of Sunrise sponsored the monthly Lauderhill Chamber of Commerce networking breakfast at Inverrary Country Club in Lauderhill, Florida. 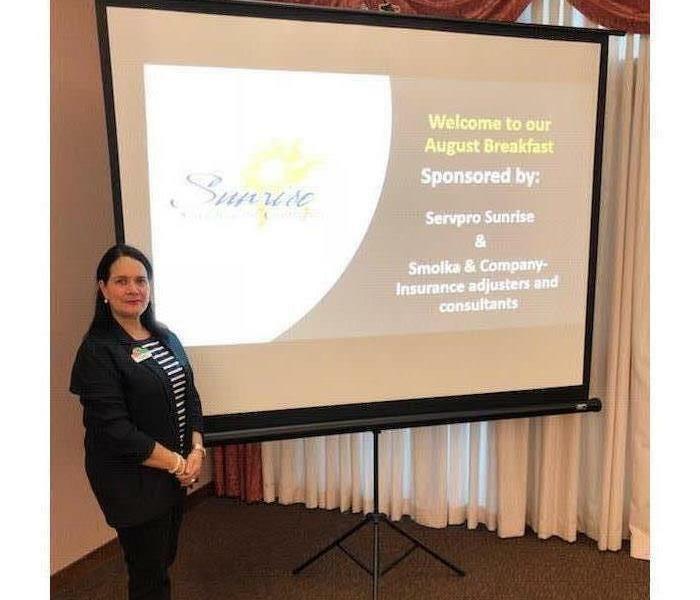 Tara Larkin marketing representative of SERVPRO of Sunrise with owner Ana M Diaz Granados at the Inverrary Country Club, where SERVPRO of Sunrise sponsored and did a presentation at the monthly networking breakfast of the LRCC. 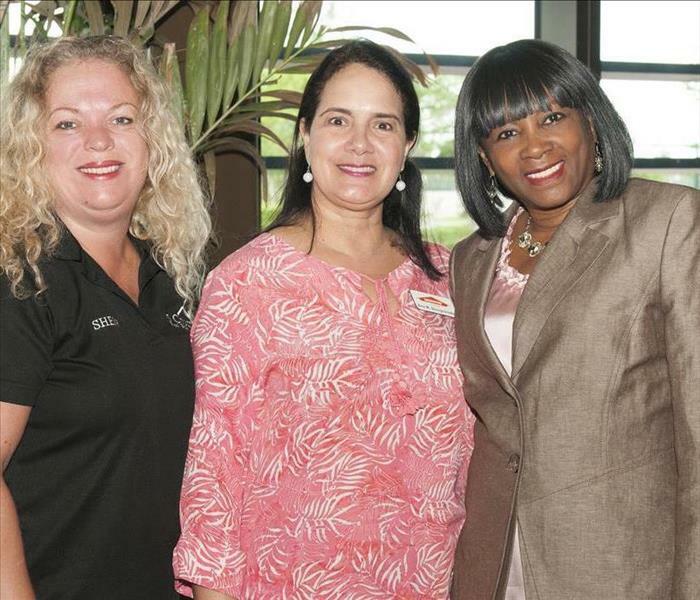 SERVPRO of Sunrise owner Ana M Diaz Granados attending Minority Women Owned CERTIFIED Lauderhill Chamber of Commerce monthly breakfast.